The Prince William County Service Authority carefully considers its impact to the environment when conducting wastewater treatment. 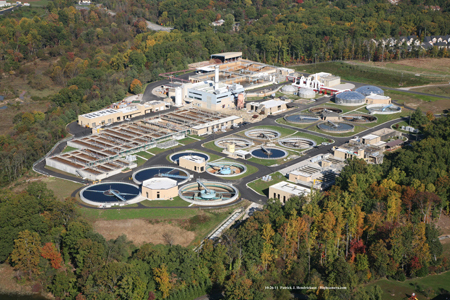 Recently, the Environmental Services and Water Reclamation Division and the Geographic Information Systems Department completed a pilot project in which they charted where stormwater flows at the Service Authority’s wastewater treatment plant in Woodbridge. To prevent stormwater contamination, industrial materials at the plant are kept covered or are placed in secondary containment structures. By tracking the direction of flow of stormwater, the Service Authority is better prepared in the unlikely event of a spill or leak occurring at its H.L. Mooney Advanced Water Reclamation Facility (AWRF). The Service Authority does its best to protect the Potomac River, an ecologically sensitive tributary of the Chesapeake Bay located near the plant. The plant is close to county, state and federal protected resources including the Featherstone National Wildlife Reserve, Leesylvania State Park, the Metz Wetlands Bank as well as the Rippon Landing and Neabsco Eagles Parks. Starting in March 2014, Senior GIS Analyst Yeoanny Venetsanos began capturing data from the Environmental Services and Water Reclamation staff to create a detailed map of the plant showing the route rain travels from each portion of the property. Eventually the map will serve as a single hub where Service Authority employees can click on a stormwater egress point and find associated documents like air or National Pollutant Discharge Elimination System (NPDES) permits or engineering plans. The Mooney AWRF already has implemented several preventative measures to preclude storm runoff from reaching Neabsco Creek, a tributary of the Potomac. These include detention ponds that help control and lower sedimentation and erosion as well as Resource Protection Areas, vegetative buffers that help filter pollutants and minerals like phosphorus and nitrogen before the runoff can reach the Neabsco. Chesapeake Bay regulations place strict limits on nitrogen and phosphorus, which the Mooney AWRF has met in the plant’s effluent for the last five years, earning the Service Authority a NACWA Platinum Award. The facility recently received a five-year No Exposure Certification from the Virginia Department of Environmental Quality, which means that the plant does not require a permit for its stormwater discharges because its industrial uses do not come in contact with stormwater. Industrial activity is either treated or contained in buildings or storm-resistant shelters. Even with the no-exposure certification from the state, the Service Authority will continue updating its Storm Water Pollution Prevention Plan on a regular basis, conducting regular inspections of storm water elements and training staff on how to prevent stormwater pollution. The Service Authority also has spill kits located in strategic locations around the property. These kits, which include buoys similar to the ones used in oil spills, are inventoried twice a year to ensure the supplies are in place and in proper working order. The organization cares deeply about the surrounding environment and the impact on aquatic life in the watershed. Fish regularly gather at the bottom of the effluent outfall, which cascades treated water into Neabsco Creek. “Preventing stormwater quality degradation is a key component of the Service Authority’s mission of being a good steward of the environment,” said Mahieu.